Capt. Kevin Butler, who commanded a company with the 101st Airborne Division in Afghanistan from January to July 2002, passes down some of his experiences from his deployment to 3rd Brigade Combat Team members from Schofield Barracks who will soon be sent to the region. Six Army captains who commanded units in Afghanistan gave advice that seemed simple enough. "Go out and get those cold weather trigger mittens that ice climbers use." And "Watch out for any deviations in the pattern of life around you -- simple things like when does school get out or market hours." Soldiers of the 25th Infantry Division's 3rd Combat Brigade Team, which will spend the next year in Afghanistan, listened during a three-day seminar at Schofield Barracks last month. Maj. Pete Kilner, a West Point professor, said the seminar was "to arm these leaders with a new and potent weapon -- the knowledge of their predecessors." "There is no substitute for actual experience," said Maj. Nate Allen, a leader of the CompanyCommand Team that developed the program. "However, we can more effectively prepare for an upcoming experience by learning all we can from those who have already had the experience. It's just so powerful to connect leaders who have 'been there, done that' with those who are preparing to 'go there, do that.'" Although this professional development program, supported by the U.S. Army's Center for the Advancement of Leader Development and Organizational Learning at West Point, is four years old, the 25th Infantry Division became the first unit where leaders from the last four Afghan combat rotations sat with soldiers on the verge of deploying. Kilner said $25,000 program was funded by West Point. 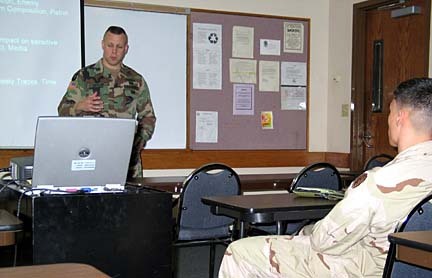 Up to this point much of this shared learning was conducted online through a Web site that Kilner estimates has been used by 5,000 Army company commanders. "As professionals, almost everything we need to know, we know collectively," Kilner said. "What we need to do is connect to the right people." Kilner said he believed that the junior leaders heading for Afghanistan can be better prepared by talking with "those in the experience and those coming out of the experience." "There is no substitute for experience. We can more effectively prepare for that experience by connecting with those who have already done what we are preparing to do." Last December, after the 3rd Bronco Combat Brigade Team knew that 3,500 of its soldiers would be in Afghanistan, Maj. Mark Tribus, the unit's personnel officer, sought the advice of other junior leaders who have already fought there. Kilner said his organization sent 70 copies of the book "Taliban," by Ahmed Rashid, to help the 3rd Brigade's leader "understand the culture, history and politics of the region and the people." CompanyCommand also developed a 20-question Web-based survey and invited officers who commanded a company in Afghanistan to complete it, Kilner said. Questions dealt with gear and equipment, things that surprised them, types of missions, innovations they were forced to implement, and things that affected their mission. Nearly four dozen past company commanders responded, Kilner added. "Some of them while they were still in Afghanistan and their responses were collated and included in a book." The initial draft of the 82-page "Afghan Commander After Action Review" book was delivered to the 3rd Combat Brigade Team in January and the final version this month. Past Afghan company commanders cited areas such as communication, convoy operations, transportation, resupply and maintenance in which they had the most problems. The book is meant to be "a springboard" and Kilner hopes leaders from the 25th Division use it to contact soldiers who contributed to it. The last step involved six officers who spent three days at Schofield Barracks holding seminars, professional development sessions and simple informal conversations with soldiers heading to Afghanistan, Kilner said. In one seminar, Capt. Kevin Butler, who commanded a company with the 101st Airborne Division from January to July 2002, told 3rd Brigade Combat Team leaders to be aware of their surroundings in Afghanistan. He described them as "pattern of life experiences." Butler, who was in the first Afghan campaign, said soldiers in his unit noticed that someone was flying a green kite near their compound. "But the color of the kite changed every time we went out on patrol," Butler added. Another "pattern of life experience" dealt with knowing simple things like market hours or when school gets out. Many times women and children leave the streets because they know something is going to happen, Butler said. However, in this one instance the streets were deserted because it was prayer time. In another session, Capt. John Miller, who led a company in the 82nd Airborne Division during the second Afghan rotation in 2002, said his soldiers were "equipped with cold weather mittens from his father's Army." He suggested commercial gloves with the fingers cut off. Second Lt. Jeremy Cervantes, a platoon leader with Bravo Company, 2nd Battalion, 5th Infantry, said "It was a lot more helpful after seeing some of the pictures they presented, it gives me a better idea where we are going."